While it initially appears to be yet another of those feather-light tributes to the indomitable, never-say-die spirit of its plucky heroine, the message in Zootopia (Zootropolis in the UK) is actually a far more grounded and timely one. Zootopia isn’t a call to action to pre-teen girls to pursue their dreams and not be discouraged when they – probably – fail to achieve them, but a warning against the dangers of stereotypical prejudice in a society in which those who until recently had lived separate lives now find themselves jostling for space in the same confined metropolis. Most of the story takes place in the eponymous city, a vast melting pot in which predatory anthropomorphic animals and those who were once their prey now live in relative harmony. But even in a society created by animals, it’s necessary for those who seek to break the law for personal gain to be policed, and it’s the dream of young rabbit Judy Hopps (Ginnifer Goodwin) to become the city’s first rabbit police officer. 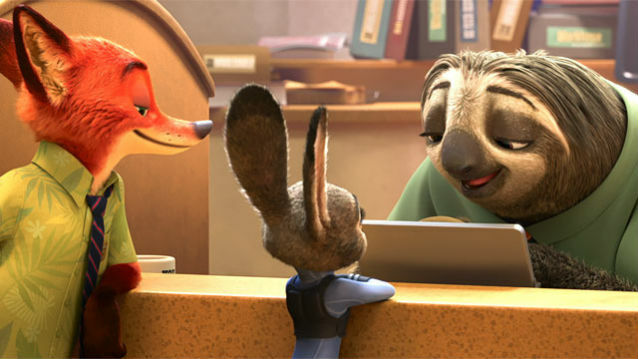 However, Judy’s odds-defying attempt to become a cop forms only the prelude to an investigation which sees her joining forces with wily fox conman Nick Wilde (Jason Bateman – Hancock, This is Where I Leave You). Wilde’s help is initially offered only as a means of retrieving an incriminating recording in Judy’s possession, but his attitude towards the rabbit softens as he aids her in her hunt for a missing otter which, if successful, will finally prove to her sceptical police chief, Bogo (Idris Elba – Pacific Rim, Beasts of No Nation) that she really does deserve her place on the force. However, the motive behind the disappearance of the otter – and a further 13 animals – proves to be a sinister one intended to whip up public opinion against the predatory animals. The city of Zootopia is a world in microcosm, defined not only by the vast variety of animals living and working within its borders, but by its distinct districts, each of which provides optimum living conditions for its residents. The buildings in Little Rodentia are no taller than Judy Hopp’s knees, providing perfect accommodation for the rodents who live there; TundraTown is an arctic region perfect for Polar Bears, while the Rainforest district is home to jungle creatures. The different animals such disparate climes attract live in harmony – until, that is, Judy inadvertently triggers mass hysteria over the possibility that the predators are reverting to the bloodthirsty instincts that have lain dormant in their DNA. The parallels between this whimsical animated world and our own at a time when racial prejudice and profiling is something of a hot potato are virtually impossible for most adults to miss – although it will probably bypass most kids’ consciousness. It’s unusual for a children’s animated movie to address such weighty matters, but it’s a welcome departure from the norm. 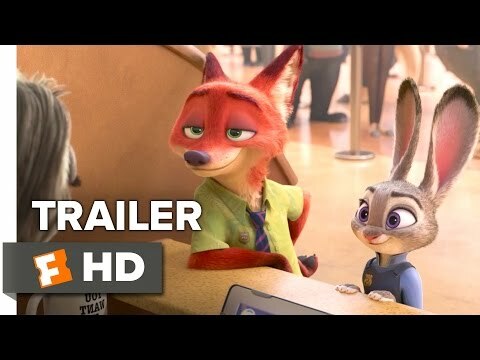 While Zootopia makes for undeniably pleasant entertainment that will please both kids and parents, the laughs are fairly thin on the ground – the film is more clever than funny, and mines for audience goodwill with plenty of references to earlier Disney films and other iconic movies and TV series like The Godfather and Breaking Bad. There are scattered moments, though, like Judy’s frustrating experience in a DMVC office manned by sloths, which are achingly funny. Judy and Nick make a likable duo, with Judy’s bouncy enthusiasm tempered by Nick’s wry cynicism, and there’s a host of colourful secondary characters to pick up the slack when required. While Zootopia might not be up to the standards of Pixar’s best, it nevertheless delivers solidly consistent entertainment.